Monday, June 8, 2015 – 2:06 p.m.
ELMAU, Germany >> Despite setbacks that have raised doubts about his policy, President Barack Obama voiced optimism Monday that the Islamic State would be driven out of Iraq, but said the effort will take time and require an inclusive government in Baghdad. Obama said the U.S. will continue to ramp up training and assistance to Iraqi troops so they can carry out offensive, not just defensive, operations. Obama and Abadi spoke on the sidelines of a meeting of leaders of the Group of Seven industrialized economies. The session with Abadi came just a day after an Iraqi general declared that Iraqi troops, backed by Shiite militias, had recaptured key parts of the northern refinery town of Beiji from the Islamic State. The news was a welcome change of pace for the U.S. after Islamic State militants won a major victory by capturing the city of Ramadi, the capital of Iraq’s Anbar province. Abadi thanked Obama and G-7 members for standing with Iraq against the Islamic State. He said Iraqi troops were winning a number of battles and downplayed Ramadi’s loss. “We lost it only temporarily,” he said. Obama also expressed confidence in Abadi’s leadership, saying the prime minister appeared committed to creating an inclusive government that gave voice to the various factions in Iraq. “There’s a refreshing honesty in the part of the prime minister that a lot of work needs to be done,” Obama said. Obama on Monday sought not only to address pressing Mideast problems, but also to convince European leaders to maintain sanctions against Russia in the face of fresh violence in Ukraine. Obama participated in the final day of the G-7 summit under the strain of an intimidating list of global pressures and little signs of movement to address them among the world’s largest industrial democracies. Climate change and terrorism topped the official agenda, but leaders also grappled with Russia’s aggressive moves on Ukraine, an upcoming nuclear deadline with Iran, tenuous trade pact politics and an impasse over Greece’s international bailout. Obama met privately with French President Francois Hollande, a sometimes skeptical partner in the talks with Iran over its nuclear weapons program. Among the issues they discussed, the two leaders agreed to stay united in pursuit of a comprehensive agreement with several other world powers to keep Iran from obtaining a nuclear weapon, the White House said. They also agreed that sanctions against Russia should remain until the Kremlin fully abides by a peace agreement with Ukraine. Obama and Hollande also discussed climate change, the threat from Islamic State militants, trade and instability in Libya. White House press secretary Josh Earnest said Obama wants to look for “more efficient ways that we can offer assistance to Iraqi security forces” and he expects that will be part of the discussion among the G-7, which also includes Britain, France, Germany, Italy, Canada and Japan. On another battlefront, in Ukraine, Earnest said Obama was urging European leaders to renew sanctions against Russia that are set to expire at the end of July. Obama wants the Europeans to leave the financial penalties in place until Moscow complies with the terms of a cease-fire agreement reached four months ago in Belarus. Some of the worst fighting since the cease-fire was agreed to broke out last week in eastern Ukraine. “Russia has essentially thumbed their nose at the commitments that they made in the context of the Minsk negotiations,” Earnest said. He urged Europeans to stay the course, while acknowledging it could cause financial pain because their economies are tied to Russia. This story has been corrected to note that Obama commented at the beginning of his meeting with Abadi, not at the end. The seizure of Ramadi on May 17 by the Islamic State in Iraq and the Levant (ISIL) was a tactical defeat for the Iraqi Army, the Iraqi government, and — by extension — the U.S.-led coalition. ISIL had a good day; Iraq and its allies had a bad day. Losing Ramadi makes the task ahead more difficult. There is no sugarcoating this fact, and therefore the latest round of self-examination is appropriate, if often misinformed. There are three policy goals that the United States has — or should have — in Iraq. First, it needs to help facilitate the defeat, if not destruction, of ISIL in Iraq (as a first step to its wider defeat in the region). Second, it needs to keep Iraq unified so that the gains of ISIL’s destruction can be held. Finally, it needs to ensure that this unified Iraq is as Western-oriented as possible. While the first of these goals is the most immediate, it is the last two that are most important, and to which too little attention is being paid. The coalition (and we all know this is a fig leaf for simply saying “American”) strategy for defeating ISIL is primarily a military one. The coalition has other official lines of effort — countering foreign fighters and countering threat financing, for example — but the military line is the most immediate. This military support appears to come in four areas — training, equipping, providing intelligence, and air support. The political reasons for this strategy are obvious. There is no political will to do otherwise. To explain this to any politically aware U.S. reading audience is superfluous. And while it is easy to blame the current administration, one must be aware that they are responding to a deeply held mass political preference to get and keep U.S. troops out of Iraq. But often lost in the U.S. political debate is the Iraqi end of the equation. There are no U.S. combat troops on the ground in Iraq for two reasons — the United States has not offered them, and the government of Iraq has not requested them. The reason for this is quite simple — there are significant factions inside the Iraqi polity who have made it clear they will see the introduction of U.S. forces on the ground as a violation of Iraqi sovereignty, and therefore an invading force. And strictly speaking, this would be legally correct in the absence of a United Nations mandate or an agreement with the government of Iraq. The Sadrist factions (meaning all those who follow the teachings of Muqtada al-Sadr’s late father, not simply those under Muqtada’s banner) would probably react accordingly, and it is not too strong to say that any U.S. forces introduced might be fighting in two directions. The Sadrists by no means represent all Shia, whether in the Iraqi Army or the Popular Mobilization Units (PMUs), but their numbers are not insignificant. Therefore, an indirect strategy to enable partner forces on the ground is — far and away — the most prudent alternative. Further, when we look hard at the recent failure in Ramadi, the issue appears to be less a problem with the strategy, and more a problem with the execution of the strategy. At the time of their defeat, the Iraqi troops in Ramadi had been fighting against ISIL and allied militants and taking significant casualties for about 18 months (say what you want about “will to fight”), so any training failures cannot be fairly attributed to the coalition. However, other problems remain. For example, there was clearly a failure to properly equip the Iraqi Army forces in Ramadi since the summer of 2014 when the anti-ISIL coalition went operational and Washington committed to strengthening Iraqi forces. That ISIL has been using car bombs with suicide drivers (Suicide Vehicle-Borne Improvised Explosive Devices, or SVBIEDs, in military vernacular) as part of their complex attacks is well-known. As any infantryman with service in Iraq can tell you, the proper defensive tactic against an SVBIED is an anti-tank missile. The Kurds have been using this tactic to great success in the north. So in Ramadi we have a known ISIL tactic in the SVBIED, we have a known countermeasure in the anti-tank missile, and yet there were no anti-tank missiles available in Ramadi, leaving the Iraqi Army helpless against these weapons, many of which were of the same size and construction as that used by Tim McVeigh in the Oklahoma City bombing. This is not a lack of “will to fight.” This is a lack of adequate equipment. Any force — even the U.S. Army or Marines — faced with multiple SVBIEDs, and lacking any ability to defend against them would likely break and withdraw, regardless of their numerical superiority. It is unclear where the fault lies. Did the missiles not make it to Iraq? Were the missiles in Iraq but not in Ramadi? Did the Iraqi Army headquarters (and their U.S. advisors) think there were missiles available in Ramadi when there were not? Was there a failure in the Ministry of Defense or in the Iraqi logistics network? Was the danger of the SVBIED and the appropriate countermeasure not disseminated? We do not know the answers to these questions, but if there is blame to be allocated, it appears that at least some of it goes to the U.S. advisory effort led by the Pentagon and CENTCOM, and not to any lack of will among the Iraq frontline units who were defeated in Ramadi. And again, this is not a problem with the strategy. The United States should have done everything it could to get these missiles to Ramadi. It did not, but this is a problem of execution, not of strategy formulation. The fact that the sub-state Kurdish Regional Government, which has complained loudly through their Washington lobbyists about their lack of weapons, has these missiles while the Iraqi Army does not is the height of irony. Another aspect of the U.S. strategy is to provide airpower support to the Iraqi forces engaged in combat on the ground. There is now wide criticism of the rules of engagement limiting the use of U.S. airpower by both airpower advocates and politicians. While the limitations of any weapons system can often be difficult for the uninitiated to understand, the anecdotal evidence of ISIL convoys moving unmolested, while the main ISIL supply routes run through what was once Syrian and Iraqi territory, does raise eyebrows and make one wonder if there is not more the United States could be doing with airpower. So in short, rather than call for a new strategy, one might instead call for a more effective execution of the one that currently exists. It appears that — while issues with the Iraqi Army and other security forces certainly remain — the decisive factor in the fall of Ramadi was the absence of a weapon system that our strategy should have ensured was on hand. This is a failure of tactics, and not of strategy, and therefore a failure of the Pentagon, and not the White House (again, without dismissing real issues, and the possibility of political interference, there as well). A unified Iraq is a key U.S. interest because the alternative is unthinkable. Many columnists like to write about the breakup of Iraq or advocate that it should break apart, but it is not clear that they understand for what they are calling. The breakup of Iraq would be a humanitarian disaster of epic proportions. The borders between Iraq’s various ethno-sectarian groups are not clean ones, and the dividing lines between Shia and Sunni (Baghdad, Sal-a-Din, Diyala) and Sunni Arabs and Kurds (Diyala, Mosul, Kirkuk) would be bloody ones, particularly for the various minority groups (Turkmen, Christians, Yezidi, etc). The partitions of countries have historically always involved further war, death, and destruction (see India in 1947, Yugoslavia in the 1990s, or — more recently — Sudan). Should this worst case occur, the world should expect to see wars within, and not only between, Iraq’s various ethno-sectarian groups. Iraq’s Sunni are divided, particularly between the Anbaris and the northern groups in Sal-a-Din and Mosul. Anyone maintaining that there would be a coherent “Sunni-stan” in a divided Iraq does not understand the internal dynamics of Iraq. One could see further divisions within Iraq’s other groups as well, and a rekindling of civil war between Kurdish factions is far from unthinkable, as is a splintering of Iraq’s south between the southernmost oil-rich provinces and the more resource-poor provinces of Karbala, Najaf, Babil, and Baghdad. [A]s we are likely to find out in the coming years, there is no way for Iraq to be divided into three homelands for Shiites, Kurds and Sunnis without experiencing exactly the massive human misery that [Joe] Biden, [Leslie] Gelb and others hoped partition might forestall. No clean ethno-sectarian lines already exist in Iraq, meaning that the boundaries of the various statelets would have to be fought over. The populations of northern and central Iraq in particular are so intertwined that separating people into sectarian enclaves would immediately prompt violent sectarian cleansing on a scale sure to exceed that of Yugoslavia. At least a quarter of a million non-Sunnis would probably be forced to leave Sunni-majority territories, while more than half a million Sunnis would probably be expelled from the greater Baghdad region, with those Sunni Baghdadis that remain herded into ghettos in and around the city. There would also be millions of Iraqis caught in limbo. What would become, for example, of the large minority population that is not Sunni, Shiite or Kurd? And what would become of Iraq’s more than 1 million Turkmen? What would become of the millions of Iraqis in intermarried families of Shiite and Sunni or Arab and Kurd? The fragmenting of the country into sectarian cantons would leave these millions with no clear place to go. Keeping Iraq together is in the U.S. national interest, as the last thing this volatile region needs is another failed state analogous to Syria. Fortunately, it appears most of Iraq’s citizens realize the dangers of state failure as well, so true breakup — while still a terrifying possibility — remains a low-probability event. Despite the recent defeat in Ramadi, the war against ISIL is still one in which the Iraqi government and pro-government forces are on the offensive. But there remains a danger that once ISIL is ejected and Iraq is kept together, that Iran will emerge as the greatest beneficiary, with its allies and proxies enjoying increased status in Iraq. Were the United States to increase Iranian influence in Iraq as a result of saving Iraq, this would be the most subtle of snares. The United States has a huge narrative problem when it comes to the bulk of the Iraqi population. In the past month, the Iraqis have heard one congressional committee call for the breakup of their country, another congressional committee call for the reoccupation of their country, and a cabinet secretary impugn the “will to fight” of their army. Taken in concert, it is not difficult to see why Iraqi citizens might think that the United States intends to use the ISIL crisis to dismantle their country, re-occupy their country, or both. Public statements such as these are not helpful, and — to be blunt — aid and abet Iran in their campaign to build political support in Iraq. I am sure this sounds ungrateful to most U.S. citizens after the blood and treasure expended in Iraq, but it is something that is necessary to understand if we wish to extend influence. Most importantly, we need to understand how what is said in the United States is heard in Iraq; not what we intend to say, but how it is heard. Particularly when more rational and informed voices are urging us to keep calm and not panic, these statements are deeply counterproductive. Political leaders in the United States should be in the business of bolstering our allies, not making it more difficult to be a friend of the United States. We have in the current Iraqi government perhaps the best arrangement of political leaders we could hope for under the circumstances, each representing the best and most moderate tendencies among their ethno-sectarian group. President Fouad Masum, of the Patriotic Union of Kurdistan, appears to be replicating the calming influence previously exercised by the now-incapacitated Jalal Talibani. Prime Minister Haider al-Abadi is exercising power as the Western-educated technocrat that he is, albeit in very difficult circumstances. And Parliament Speaker Dr. Salim al-Jabouri, a Sunni, continues to try to calm his constituency as the Iraqi government works to find ways to further compromise with its Sunni Arab minority — a very difficult balancing act. The United States should weigh all its actions — military to rhetorical — through the lens of supporting this government. By this measure, U.S. actions have in past weeks been counterproductive. The fight against ISIL in Iraq is Iraq’s before it is ours. If Washington undercuts its primary ally in this fight, the United States puts itself in the unique and unenviable position of giving unintended support to both ISIL and Iran. The U.S. strategy of supporting Iraq remains sound, but further refinement of its execution — particularly but not exclusively along the lines of equipping and air support — appears to be called for. But equally important, U.S. policymakers need to perform a “sanity check” on their actions and statements, thinking about how these will be received by our ally — both in the capital and “on the street.” We are in competition with Iran for influence in Iraq. U.S. policymakers should not further handicap that competition. As I have argued before in these pages, it would be tragic were the United States to succeed in helping Iraq eject ISIL, only to have Iran’s allies in Iraq take the political credit, and cement an Iranian-friendly government through democratic means. All actions taken in or with regard to Iraq should be weighed to avoid contributing to this possibility, so that one of the precious few democratic states in the region does not end up in the orbit of a U.S. rival. Dr. Douglas A. OIlivant is a Managing Partner and the Senior Vice President of Mantid International, a global consulting firm with offices in Beirut, Baghdad and Washington D.C., which has financial interests in Baghdad and southern Iraq. He is also an ASU Senior Fellow in the Future of War project at New America. Follow him on Twitter at @DouglasOllivant. 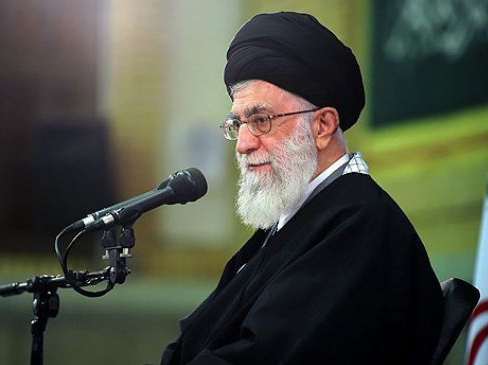 Iran’s Supreme Leader Ayatollah Seyyed Ali Khamenei said that the Islamic Republic favors unity among world Muslims. Khamenei made the remarks in a meeting with officials in charge of Hajj pilgrimage in Tehran Oct. 28, Iran’s official IRNA news agency reported. He advised officials in charge of Hajj rituals to help augment people’s knowledge, address their spiritual needs and strongly deal with the smear propaganda campaign of enemies of Islam. The enemies of the Muslim world try to build a wall between the Islamic Republic of Iran and the rest of the Islamic world, said the Supreme Leader. Hajj ceremony is a suitable opportunity to destroy the wrong concepts and beliefs propagated by the enemies, Khameni added. The officials in charge of Hajj rituals should address the needs of people by offering better services and meeting the spiritual needs of pilgrims, he said. As for the spiritual aspects of the Hajj rituals, special programs should be arranged to address the requirements of pilgrims, said Khamenei. Unity among world Muslims is of prime importance, underlined the Supreme Leader. Islamic unity is among the principled mottos of the Islamic Revolution, Ayatollah Khamenei said, adding that it means the Muslim people should avoid enmity and back each other in dealing with global developments. All should help remove the wall created by the enemies with an aim of separating Iran from other parts of the Muslim world, Ayatollah Khamenei said, advising that all should do their best to remove such a hurdle. To attain this goal, Hajj rituals is the best opportunity, he said. The enemies try to shatter the image of Shiism by disseminating wrong information, underlined the Supreme Leader. The root cause of such false propaganda should be detected and uprooted, he said. Baghdad, Asharq Al-Awsat—Iraqi Shi’ite leader Moqtada Al-Sadr called on Baghdad to pursue a new regional foreign policy with the formation of a new government led by prime minister-designate Haider Al-Abadi. “We must open up to the other countries [in the region] to end the security and sectarian crises,” the Sadrist leader said in a statement at a joint press conference with Islamic Supreme Council of Iraq (ISCI) leader Ammar Al-Hakim. Hakim, another senior Shi’ite figure in Iraq who opposed Maliki bid for a controversial third term in office and is now backing Abadi, reiterated Sadr’s call for a new regional foreign policy, saying it was a mistake for Maliki to avoid allying with neighboring Arab states. “One of the mistakes that the Maliki government made was to avoid allying with neighboring states, including Saudi Arabia. We must return this relationship to return security [to the region],” Sadr said. Sadr and Hakim both publicly announced their support for Abadi and the national unity government he is seeking to form during the press conference which was held on Thursday in Najaf. Abadi has until September 10 to form a new government. Sadr and Hakim confirmed that government talks are well under way, with the distribution of ministerial portfolios currently under discussion. Abadi has pledged to form a national unity government that includes all components of the Iraqi people. “We will strongly support the new government to end the political and security crises through dialogue so that it will be a true government of national participation,” he said. He called on all parties to deal “realistically” with the situation in the country and work together to form a government as soon as possible. Iranian President Hassan Rouhani (L) greets Amir of Kuwait, Sheikh Sabah al-Ahmad al-Sabah (R) upon his arrival in Tehran on June 1, 2014. TEHRAN: Iranian state TV says the country’s top leader has called for better ties with Iran’s Gulf Arab neighbors during a rare meeting with the visiting Kuwaiti emir. Khamenei has the final say on all state matters. He says differences among countries in the region will only please their common enemies, and expressed hope for “a new chapter” of economic relations between Iran and Kuwait. State TV also said the two countries signed six agreements, including one related to security, during the two-day visit of the emir, Sheik Sabah Al Ahmad Al Sabah. The U.S.-allied Gulf states are wary of Iranian influence in the region and Tehran’s nuclear ambitions.